RAPAPORT... A rare Kashmir sapphire necklace could set a new auction world record when it goes under the hammer at Christie’s Hong Kong sale on November 27. The Peacock Necklace — which will lead the Magnificent Jewels auction — contains 21 cushion-cut Kashmir sapphires weighing a total of 109.08 carats. 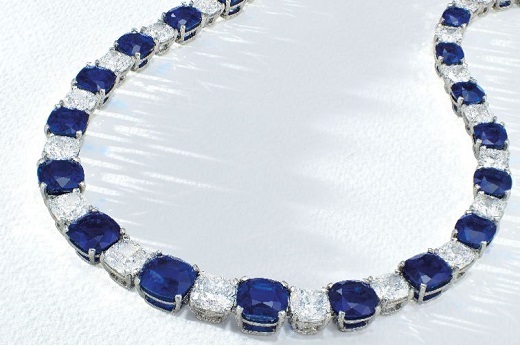 The piece, with its 10.56-carat center sapphire, is estimated at $12 million to $15 million, making it potentially the most expensive Kashmir sapphire necklace per carat in auction history, Christie’s said. Christie’s will also offer an oval-shaped, 10.04-carat, Burmese pigeon’s blood ruby and diamond ring, carrying a presale estimate of $6.9 million to $8.7 million. Other notable lots include a round brilliant-cut, 2.10-carat, fancy-vivid-blue diamond ring, surrounded by circular-cut pink diamonds. The piece, which has been graded as internally flawless, is valued at $3.9 million to $6.4 million. The Ultimate Mogok Blue Treasure, a 396.89-carat Burmese sapphire holding the Guinness World Record for the largest cabochon-cut sapphire, is estimated at $500,000 to $1 million. The Magnificent Jewels auction will also feature the Moon of Baroda necklace, which Marilyn Monroe wore for the premiere of her 1953 movie Gentlemen Prefer Blondes.